There are a number of features we use on every site, but the one I’d like to draw special mention to is Brute Protect. Protect is a cloud-powered brute force attack prevention tool. We leverage the millions of WordPress sites to identify and block malicious IPs. Protect tracks failed login attempts across all Jetpack-connected sites using the Protect module. If any single IP has too many failed attempts in a short period of time, they are blocked from logging in to any site with this plugin installed” (Automattic). How do you activate and configure Brute Protect? With startling ease. 1. In your WordPress Dashboard, go to Jetpack → Settings. You’ll be presented with five tabs. Select “Security”. 2. Scroll down to “Brute force attack protection” and toggle the blue button (1) and the drop down arrow (2). 3. Jetpack will automatically detect your IP Address. All you need to do is click the “Add to whitelist” button (3) or copy-paste it into the field. Then press “Save Settings”. 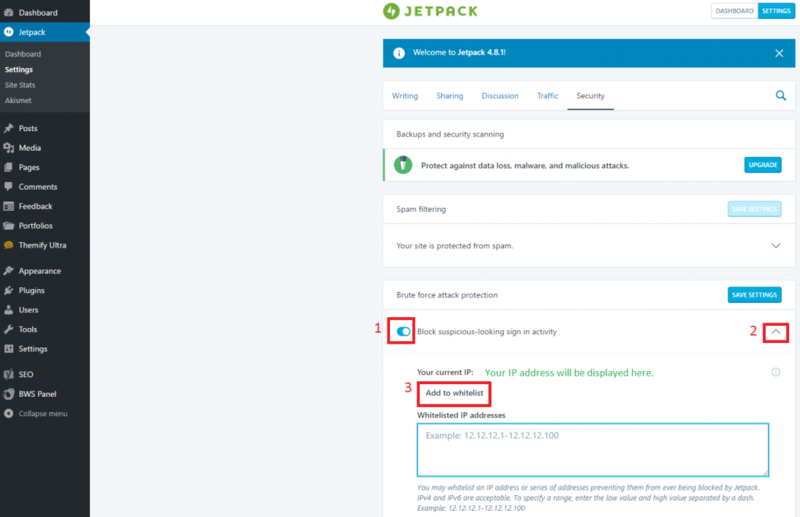 If for any reason, Jetpack isn’t able to detect your IP Address, you can find it here. What other features do we like about Jetpack? The Site Stats are useful. Social media Sharing buttons are great. The Custom CSS Editor is the best. The Carousel and Tiled Galleries are neat. The Extra Sidebar Widgets and Widget Visibility are golden. And while a little clunky, the Contact Form feature can prove valuable, too. (And as mentioned, there are many other features. While we don’t use them, you might find them helpful.) I know I’ve said this already, but this is all free. And the support is fantastic too.